Merlot’s one of those wines that’s made all over the place. That being the case you’re pretty lucky when it comes to the “eat what the locals eat” mantra. Only thing you’ve got to think about is the style of Merlot that you’re going to be drinking. When it comes to Chilean Merlot, chances are you’re looking at a medium bodied, fruity, clean, simple wine. You might get a hint of extra flavour and body if you’ve paid up the couple of quid, but that won’t make too much difference on my pick for a food pairing. I’m up in Norway this weekend for a family do, so I’m going to try eat like the locals, or at least turn the recipe into a norwegian one. I’m going for a rich tomato sauce stew, with a dash of my Merlot in for the cooking, and some slow cooked mutton, carrots, onions, and leeks to bring it all along for the ride. One tip that I picked up from reading a couple of other blogs recently is that Merlot copes well enough with a bit of spice. We’re not talking curry powder or red chills here, just things like roasted peppers, something to give it that lift of flavour. So I’ll give those a go too, hopefully without burning my brother-in-law’s house down! To accompany this meal, i’ve got to get some carbs on board for the others I’m cooking for. Take your pick really. Pasta, rice, or bread. I’ll probably end up with the local grovbrød for mopping up the dish at the end! 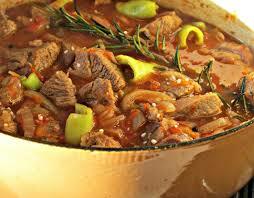 A stew is a stew end of the day, but this is a great picture, put in whatever you want! Can be a funny place to buy food, but if you ask in the right places you can get great local produce, don’t just head straight to the shops!